Finding a great logo design for your business is an important part of creating your brand identity. Sure, a great company name is important, but you’ll also want to have a design that is simple, memorable, and a good representation of what you do. Many people, in an effort to appear modern, choose a current design trend for their logo. One risk when following trends is that your logo could quickly get lost in a sea of similar logos out there on the web and in print. Trendy logos can also quickly become outdated. We created this guide to help buyers recognize design elements that are overused in logo design. From swooshy people, to “green” icons, to geometric shapes – there are many graphics that are seen in one form or another everywhere you look. The challenge is to get a great logo that will help your company stand out from the crowd rather than getting lost in the crowd. The key to success is knowing your company, and communicating with designers to find just the right look, while avoiding the overdone trends shown below. People are drawn to these icons because they promote a feeling of joy, hope, and cooperation. The problem is they have been used so much that their impact is no longer what it was when they first hit the scene a few short years ago. The swooshy person can be used creatively, but some of the most overused versions are pictured below. Geometric people start out as geometric shapes in a triangle, circle, or clover. From there, round circles are added to represent the heads. They can appear in any mix of colors, as well as black and white, and with any mix of gradients or 3-D effects. They are often used to convey cooperation or community. Geometric icons can make great logos. But certain types of images are becoming very common. The current trend is to take a complex design and change the color of one or two elements in the design. The most overused are the grid of dots, the spinning blades, and the pattern that appears to be stretched around an invisible sphere. 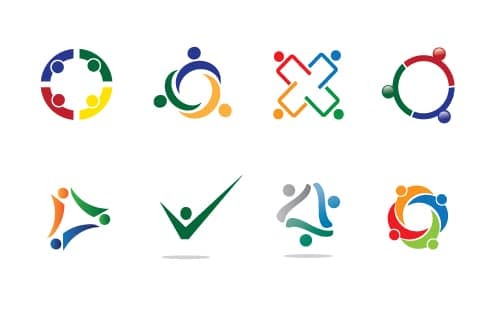 The logos below all fit the bill with business concepts of growth, a well oiled machine, stretching outside the box, and unity. These images are popular (even if they are generic) because they work well with many companies. More environmentally friendly (“green”) companies are being created every day. In addition, existing companies are becoming more “green” to keep up with the times. 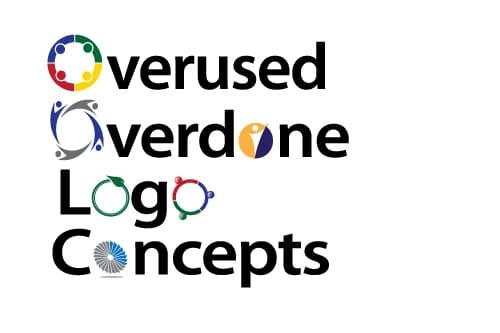 Knowing about the overdone trends will help you make an informed decision when developing your own logo. Having a modern, “fresh” logo is one thing – but having a logo with the same look and feel as other companies is not the best way to help yours stand out. 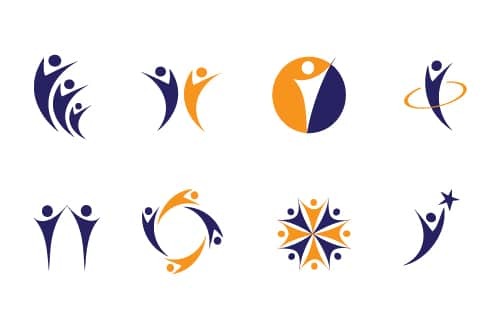 You’ll see logo designs everywhere, including in projects on crowdSPRING, containing some of these elements. Although we strongly discourage the use of such overused design elements, designers often incorporate these elements because buyers tend to like them. The goal of this post is not to make people feel bad for liking, using, or creating such images. Our purpose is to educate and make you aware that these designs are generic and mostly overused in logo design – so if you do favor a design using some of these elements, do take this into account.